I've had an offset smoker for years, wanted a new one since the one I have is about to fall apart. 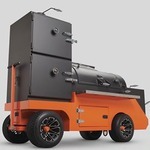 I researched the offset smokers and decided on Yoder, then I seen the pellet grills. I decided to keep the off-brand offset that I have for now and pick up a pellet smoker to use and still have both available. What a beast, unpacking it by myself was a challenge.... Yoder puts some care in the packaging, directions, shipment containers. Very well thought out and grill was in perfect condition. I really liked the "blanket" that was wrapped around the grill to keep the cardboard from chaffing the paint. Fired up some tri-tips last weekend, turned out great. Will do some ribs and chicken this weekend and a Goose for Christmas. I got 100 lbs of Hickory for free for the sale they had, will probably pick up some fruit woods as well. Next mods will be the grilling grate and dual YS thermometers. Hi Kevin! The thermometers on the lid give a good approximation of the pit temp where the probe is. Not the grate temp. I do believe you have a probe port installed for wired probes. If you get one of the many types that have 2 (more really isn't needed probes you place those about 1" above the grate area you need to monitor. That is the temp where the food is, not the air high above where the meat is. So, my recommendation is pass on the neat looking door thermometers and buy a better option. And cheaper. Maverick ET-732 I have had for years. Cheaper than one door thermometer kit you want to get. Here is mine showing a general use while smoking pistachios.